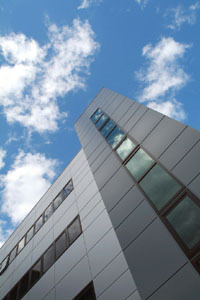 The University of Aberdeen's Clinical Research Facility is housed within the recently built 3379m² Health Sciences Building on the University's Foresterhill site. The building opened in August 2006 with the first research participants being seen in the CRF in September 2006. Any bona fide researcher can request access to the facility whether he or she is employed by the University, the NHS Trust or some other research organisation. The University CRF is suitable for 'ambulatory' clinical research such as population-based epidemiological studies of clinical trials. The Imaging Department within the Health Sciences Building boasts state of the art equipment, suitable for a variety of uses. There are two, highly qualified; research radiographers trained in all modalities and the department follows a robust Quality Control and Quality Assurance programme. Whole Body Composition which accurately shows exactly where fat is distributed throughout the body and directly measures and calculates total fat, lean and bone tissue, rather than estimating body composition. Lumbar Vertebral Assessment (LVA). The high resolution of the iDXA produces quality images which allow researchers and clinicians to visually assess the presence of vertebral deformities using this high definition, direct digital technology. The second bone densitometer is the Lunar Prodigy. It has similar functions to the iDXA but is used where BMD is the main outcome.